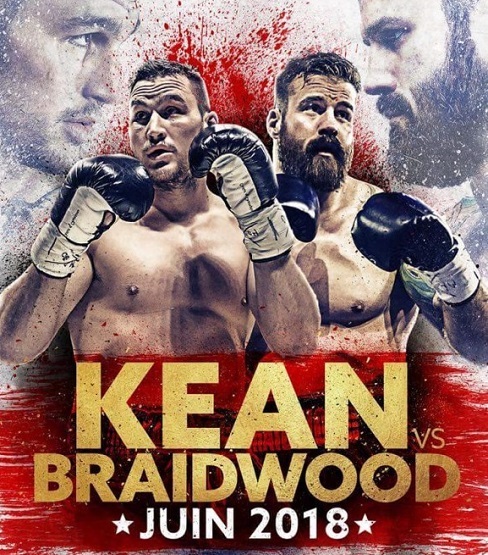 This Saturday night in the rather unlikely location of the city of Shawinigan, Quebec, one of the most anticipated fights in Canadian boxing will take place, a battle between two powerful heavyweight prospects, Simon Kean and Adam Braidwood, and everyone is hoping for an action-packed brawl. 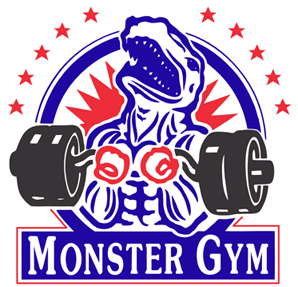 But while the spotlight will be focused on the two big men whose names are at the top of the marquee, ticket-holders and pay-per-view watchers shouldn’t overlook an undercard chock full with promising talent and excellent match-ups. Canuck fight fans hope Kean vs Braidwood is a heavyweight war. More to the point, boxing fans, especially those who will be there in the flesh to watch this show on Saturday, have a unique opportunity, a chance to witness something remarkable. As people who watch my videos know, I’m a big believer in paying close attention to the undercard matches, as it’s the best way to get a glimpse of what the future may hold, while also allowing one to see the progression of talented prospects. In fact, when watching the prelims, one has the chance to see history in the making. You never know which of today’s young prospects or fledgling contenders will emerge down the road as a world champion, or even a legend. Yves Ulysse is poised for a major breakthrough. Ulysse’s opponent is one Jose Ernesto Espana, nicknamed “El Junior,” from Venezuela. He is seven years older than Ulysse, an inch taller and undefeated in 26 outings with 20 knockouts. 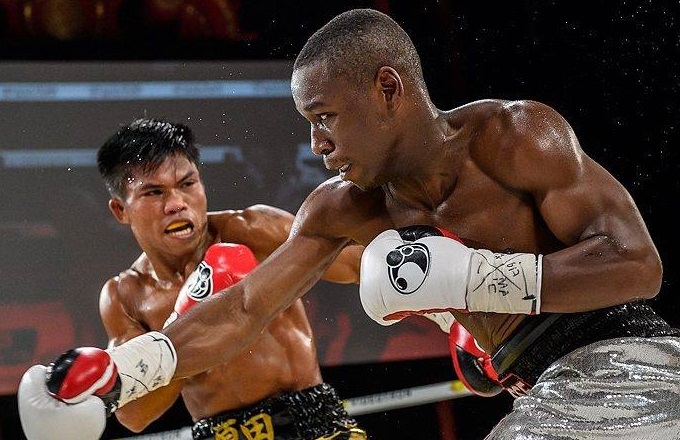 Ulysses has only had 16 pro fights and half the number of knockouts, but in my opinion he has to be regarded the clear favorite to win, not because Espana has faced mediocre opposition but because of the amazing talent and skill which Yves Ulysse possesses. Yves Ulysse with official “board member” Manny Montreal. 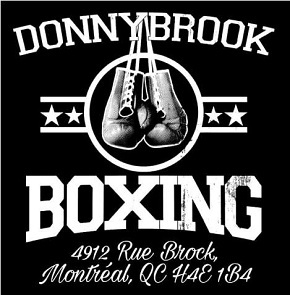 I’ve been following the boxing scene in Montreal very closely for a number of years now and I’ve seen many capable and talented prospects come along. But Yves Ulysse is something truly special. I’ve watched him since his amateur days and his time on the Canadian national team, so believe me when I tell you that, as good as he was then, he has added and improved on his skill set after every fight since. He is not yet the headliner, the star, the guy whose name is in the biggest letters on the poster, but he will be very soon. Which means very soon it won’t be possible to see him perform for such a relatively low ticket price, or in the flesh outside of a major metropolis. This is why I’m writing this article. 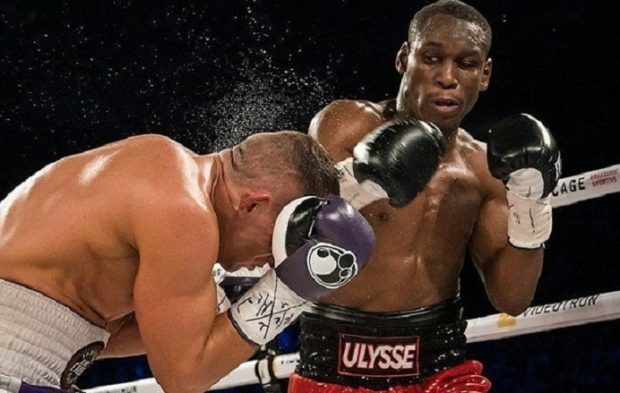 I already knew that Ulysse was a world-class calibre boxer, but in fact he has improved and is improving still. His development has outpaced his notoriety. His level of maturity and professionalism is beyond that of many pugilists who can boast big money contracts or even world title belts. I speak to a lot of boxers with aspirations of greatness but so many lack even basic knowledge about their competition, the other fighters in their weight class and those ranked ahead of them. Some don’t bother to watch video of themselves sparring or of their own fights, a lack of seriousness which I find troubling. Neither is the case with Yves. I’ve had in-depth discussions with him about the super lightweight division — past, present and future — and he knows his stuff and has even corrected me on certain things. This is a young boxer who studies his craft, studies his prospective opponents, understands the challenges which await him. I wish all Montreal boxers had the same drive and conscientiousness as, in truth, nothing less is required to reach the elite level. Now some of you may be thinking, “Wait a second. Isn’t this the same Yves Ulysse who lost a decision to Steve Claggett back in October?” And yes, this is the same fighter, but let me assure you, I can never properly acknowledge that blemish on Yves’ record as I am of the firm belief that it was a robbery. I have watched and studied that contest repeatedly and in great detail, and I have absolutely no doubt in my mind that Yves Ulysse in fact deserved that decision. It clearly was an unjust verdict and I have the stats to back up my opinion. And in fact, my extensive work on backing up that assertion is what has opened the door to me to now being an official board member of The Ulysse Nation. Naturally, I am not the only member of that board, since Yves Ulysse is a boxer in constant motion, always moving forward, always seeking to improve, always learning and adding new people to his team when necessary. His corner is led by legendary Montreal boxing coach Rénald Boisvert, with Jessy Ross Thompson serving as second-in-command. Thompson is known around The Fight City for his work with Grant Brothers Boxing, Ryan Ford, Francis Lafreniere, and Mo Soumaoro, among others. 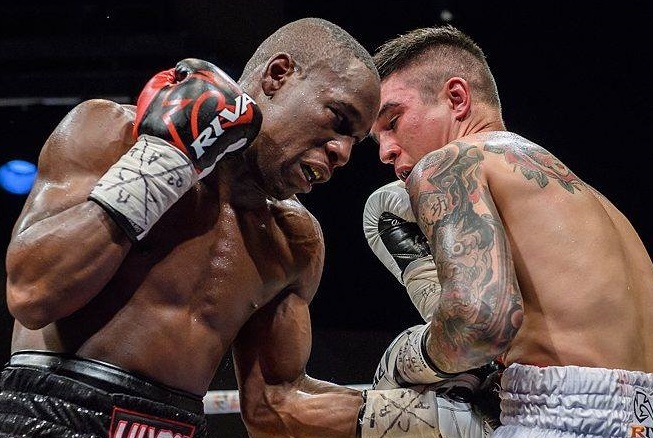 A great boxing mind in a youthful vessel, he’s well-respected and, as you’ll see in the videos here, he is a perfect addition to The Ulysse Nation. 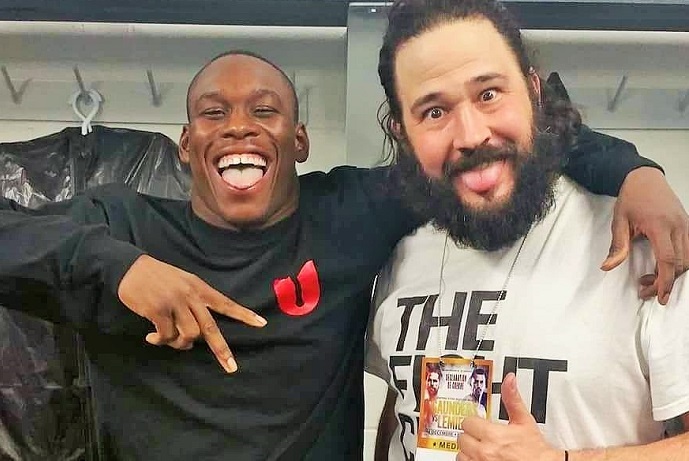 Also on the team is Anthony Coady, a former pro football player with the Montreal Alouettes and now a certified sports therapist and movement coach. It’s worth nothing that both Coady and Thompson are roughly the same age as Yves and, like the fighter himself, have a background in football. This is very positive as having good friends on the team is so important for the trust process in boxing. A strong bond of trust between a boxer and the people around him is absolutely critical to ensure future success. Finally, another new team member is sparring partner Mohamed Mimoune, an experienced professional currently ranked number four in the world at 140 pounds by BoxRec. From France and with a record of 20-2, his past titles include the European welterweight championship, the European Union welterweight title, and the IBO light-welterweight world title. His nickname is “The Problem,” and indeed he will offer Yves new problems and riddles to solve in the ring, in the process giving the younger fighter plenty of challenging work to keep him sharp and guarantee continued improvement. 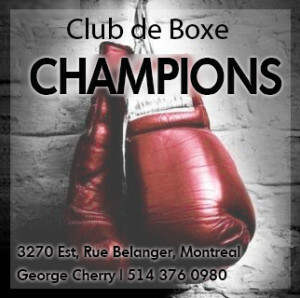 As mentioned, I was lucky enough to recently be invited with my other Ulysses Nation Board Members to witness, up close and personal, Yves’ training and sparring work at the venerable Club de Boxe Champions on Rue Belanger, and I was blown away by what I saw. Before this, I was already a huge fan and supporter, was already extremely optimistic about Yves’ future prospects. And that was before Yves dominated undefeated Cletus Seldin on HBO last December! Now I have no doubts whatsoever that Yves Ulysse is a future world champion. Which is saying a lot considering his division is stacked with killers, including Regis Prograis, Viktor Postol, Julius Indongo, Eduard Troyanovsky and Sergey Lipinets. Yves Ulysse is the future. Adam Braidwoodand Mo SoumaoroCletus SeldinEduard TroyanovskyFrancis LafreniereJose Ernesto EspanaJulius IndongoMohamed MimouneRegis Prograisryan fordSergey Lipinetssimon keanSteve Claggettviktor postolYves Ulysse Jr.